Vape Injuries: What is Popcorn Lung? E-cigarettes now make up a billion-dollar industry in the United States, growing increasingly popular every year. Touted as a safer alternative to cigarettes and a method to reduce a person’s dependence on cigarettes, many consumers mistakenly believe that vaping is not a toxic practice. However, e-cigarettes can pose significant risk to your health over time. One of these risks is a condition known as popcorn lung. Popcorn lung is a medical condition where inflammation develops in the lung tissue, damaging the smallest airways in the lung. These airways are known as the bronchioles. When someone develops popcorn lung, the bronchioles begin to scar and narrow. As a result, the patient develops difficulty breathing. Popcorn lung gets its name from its origins. Manufacturers often use a chemical known as diacetyl in food products to give it a rich, buttery flavor. Most commonly, manufacturers use diacetyl in popcorn. However, inhaling diacetyl can be quite dangerous and cause popcorn lung. The first cases of this condition developed among workers in popcorn factories who consistently inhaled the chemical in the workplace. Other products that use diacetyl are flavored e-cigarette liquids. Popcorn lung symptoms can be quite subtle and easy to overlook. In addition, patients may mistake popcorn lung for other conditions such as asthma or pneumonia. These symptoms can develop within two to eight weeks after exposure to diacetyl and can progress in severity over the next few weeks or months. If you experience any of these symptoms, you should visit a doctor. Seek immediate medical attention for popcorn lung if breathing becomes too difficult, if you experience chest pain, or you experience shortness of breath that leads to dizziness. No cure for popcorn lung exists. If you develop popcorn lung, you can receive treatment to manage or reduce symptoms and limit further damage to your lungs. You can take steroids and immunosuppressive drugs to reduce inflammation. You may need supplemental oxygen to breathe normally. In very severe cases, you may need a lung transplant. 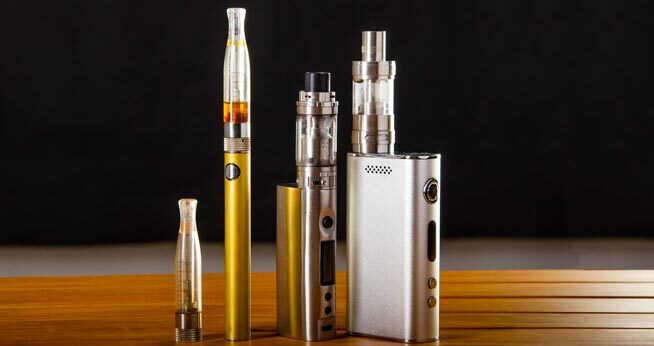 Of course, you should cease using e-cigarettes and vapes as soon as possible – the presence of diacetyl in certain e-liquids can lead to the development of popcorn lung and its irreversible effects. The American Lung Association states that using electronic cigarettes or vapes can lead to popcorn lung, especially if you use flavored e-liquids. Despite researchers linking this chemical to popcorn lung for years, many e-cigarette manufacturers add diacetyl to flavored e-liquids to add the rich, buttery flavor it is known for. Manufacturers continue to put diacetyl in e-cigarette flavors such as vanilla, coconut, maple, caramel, popcorn, and more. A Harvard University study found that 39 out of 51 brands of e-cigarette liquids contained this dangerous chemical. In addition, e-liquids can contain other inflammatory and toxic chemicals such as 2,3 pentanedione and acetoin. When looking at the effects of these chemicals in comparison to the harmful effects of cigarettes, it is obvious that e-cigarettes are not a safe alternative in any way. The only way to reduce risk of lung damage is to stop smoking, vaping, or using e-cigarettes. Yet, many manufacturers continue to push this assumption. If you developed popcorn lung due to diacetyl exposure in e-cigarettes, legal options may be available. You could pursue a product liability case against the manufacturer and receive compensatory damages to cover medical expenses. Contact a San Diego defective products attorney as soon as possible if you believe you developed popcorn lung from vaping.